Somerset Place Apartments was originally built as Somerset Hotel in 1919 as one of many apartment hotels that sprung up in Chicago during the Roaring Twenties. The building, which cost two million dollars to build, was designed in the Renaissance Revival style by owner and architect Samuel N. Crowen. 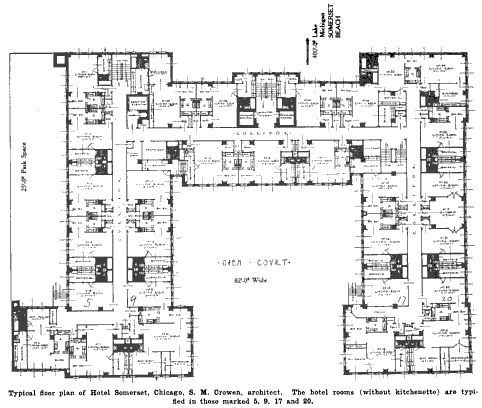 When originally opened, the 205 suites were luxuriously furnished and advertised as an exclusive summer resort as well as a residential hotel for Chicago's middle and upper class. In the words of The Economist, "The interior decorations and furnishings will be in the hands of artists... The furniture will follow period designs and individuality will dominate. The living rooms must express dignity and magnificence, the solarium comfort and ease." Luxurious amenities ranging from maid and laundry service to a full-service dining room with twice-weekly dinner dances enticed potential residents. 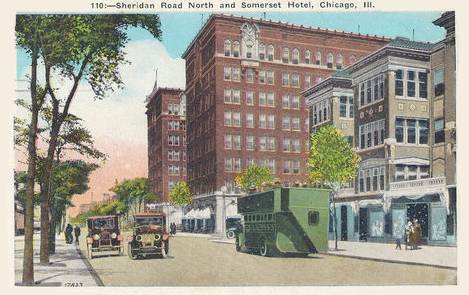 The apartment-hotel primarily catered to the middle and upper class of Chicago, particularly older, upper-income professionals and business owners, who ranged from retailers and life insurance salesmen to attorneys and investment bankers. Moreover, the building was just one block from the lake, with views of it from the solarium and rooftop garden which, according to The Hotel Monthly, was "destined to be one of the most attractive features of the hotel." At the time, the hotel even had its own private beach, with alleyway access designed for privacy. 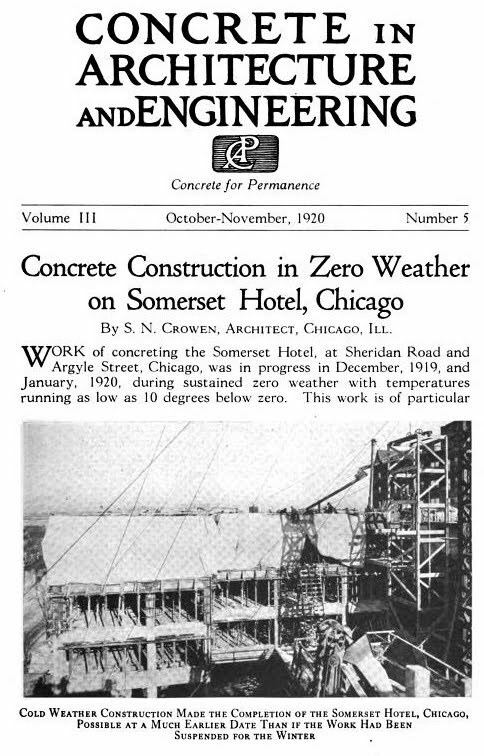 Somerset Hotel was one of the first apartment buildings in Chicago to use pre-cast ornamental concrete, an achievement that was much-heralded in the construction and architecture industries. Concrete Products wrote "Any casual observer of the new Somerset hotel... would conclude, no doubt, that the sparkling lower walls, the exquisitely molded lintels, arches, spandrels, and panels, the glistening columns and other trim with which this magnificent building is adorned is of granite and marble, laboriously quarried, sawed, carved and sculptured. His error would be pardonable for the Hydro-Stone trim employed from sidewalk to coping has all of the beauty of natural stone and many advantages not possessed by any other material." This new methodology allowed for much of the construction work to be done in cold weather, allowing for speedy construction by Paschen Bros. Contractors, who completed the building in less than eight months. Moreover, it kept costs low for a remarkably ornate design, which continues to add beauty and sophistication to Somerset Place to this day. 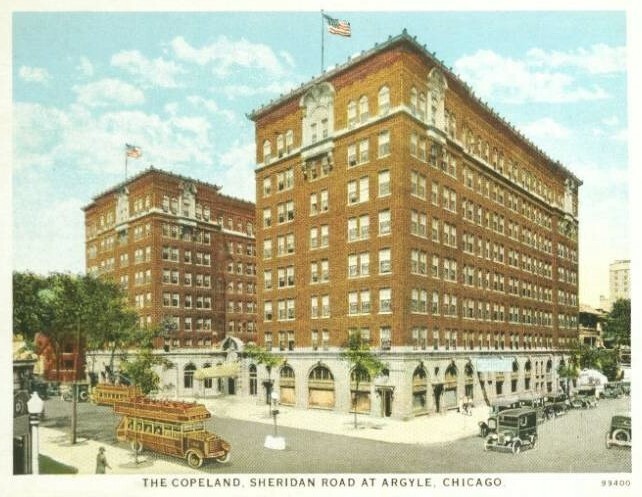 In 1924, the building was renamed The Copeland, after restaurateur Mrs. Florilla M. Copeland leased the property. 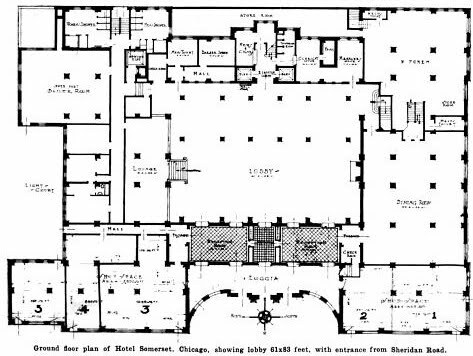 The Copeland was further enhanced by a large, self-serve eating area on the south end of the first floor, and became a meeting place and banquet hall for many groups, such as Hadassah and the Chicago Ladies Gmilas Chasodim Society. However in the 1950s, as its residents aged and young professionals began to flock to the suburbs, the Copeland's prestige began to fade. 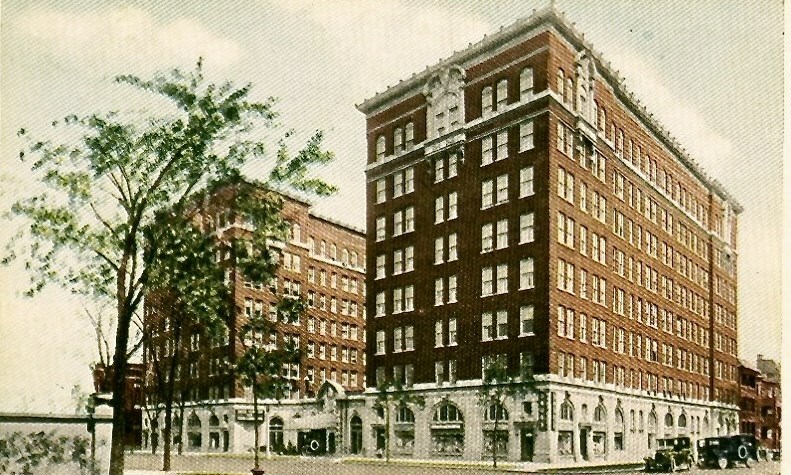 In the late 1960s, the building was acquired by George E. Goldberg's Midwest Hotel Company and run as the Somerset House, but continued to deteriorate. By the 1970s, as many of the older apartment hotels were turned into sheltered care communities, the building owners decided to apply for their own zoning change. This provoked a strong backlash from residents and community leaders interested in protecting the venerable hotel, but the owners claimed they could no longer compete with newer apartments and Somerset House would otherwise face demolishment. After several rounds of heated hearings, the city approved the zoning change. The conversion included one million dollars in renovations, and the facility operated until 2010. Zidan Management Group acquired the property in 2011, and after extensive renovations with the help of MacRostie Historic Advisors LLC, opened in 2014 as Somerset Place Apartments. These renovations focused on restoring the historic beauty of the building, including the volume, plan, and decorative elements that had previously characterized the building as one of Uptown's must luxurious apartment-hotels. This included the ornamented base and top with terra cotta detailing, which were carefully restored to match the original Renaissance Revival style, and the original arches from 1913, which were uncovered when removing the dated exterior facade and carefully restored. Inside, the ornate ceiling molding and the marble floors were carefully preserved and, as necessary, reproduced to restore its original splendor. During the restoration process, Somerset Place was certified to be included in the National Register of Historic Places as part of the West Argyle Street Historic District. The District includes 77 buildings built during the late-nineteenth and early-twentieth century and represent a variety of turn-of-the-century revival styles, including Somerset Place's Renaissance Revival style. The taller apartment hotels blended with the smaller residential buildings in the area by using similar materials: brick, terra cotta, and limestone; however, their lavishly ornamented primary facades still set them apart. At 8 stories with 441 rooms, Somerset Place further stands out as the largest building in the district, though not the tallest. Moreover, like other former apartment-hotels, it has commercial space on the ground floor making it visually distinct from the purely residential buildings which make up the majority of the district. 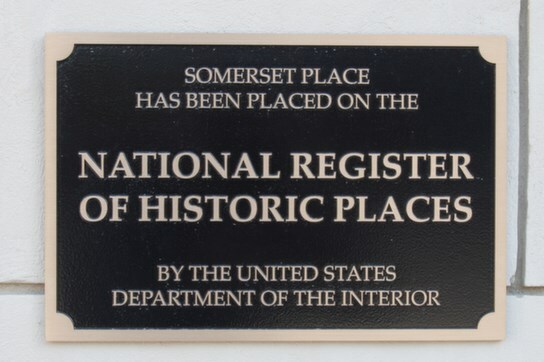 Being a part of the National Register of Historic Places has solidified Somerset Place's historical status in Uptown, and allows us to continue to celebrate its historical significance. "Living at Somerset for almost a month now and being one of the "first" residents in the building, I would recommend living here. The building has been beautifully restored with modern decor while remaining the architectural integrity. Due to this being an older building with a new management company I recommend to have patience as they work through the "opening stages". Communication on recent updates has been helpful. I've been a resident here for almost two years and I'm extremely pleased and happy to live here. It's affordable, well maintained, and a perfect place to call home in the city. Erin has been another reason why we decided to renew our lease. She has dedicated a lot of time in making the living experience here an incredible one. I will recommend this place time and time again. I've been living at Somerset since Feb 2016 and it's a really great place to live, so much so that I'm signing another lease. Erin has been nothing but exceptional. She along with the maintenance and doormen are responsive and very friendly. The building is also immaculate, the cleaning staff does a great job. Walls are super thick and I've been able to sleep very well without hearing neighbors. Somerset is a great addition to Uptown that will hopefully continue to turn the neighborhood around. It looks good! Don't know if it's the place just yet (the first apt. I looked at). But it looks really good. The building is large, the kitchens and baths are great. A little pricey, but it is within my range. I will probably go back and see it again before I make up my mind. It's definitely in the running, though. I have been a resident at this building since three months after they opened. I am happy management takes their jobs so seriously to provide us with a safe and clean home. They are very reliable and the building is usually spotless. The building itself is beautiful. I love coming home every day and walking into my lobby. I am greeted by a crazy friendly doorman. I love my apartment itself. Whenever there is an issue management sends someone to fix it immediately. I'm really happy here. Every one is really friendly and helpful. The amenities are great, the neighbors and doormen are really friendly and helpful, the rules and security of the building help keep tenants safe. Whenever you have any maintenance issues, the management and staff are quick to respond. Management is super friendly and helpful, and they do their best to keep the building clean and luxurious. I've lived here for about seven months now and I honestly still can't get over how much I love it! The details that they've put into every part of the building, from the common areas to my own unit, is really impeccable. Even the staff is so friendly and responsive to any needs. My husband and I plus our beagle were residents here for 1 year. We never had any problems. Somerset was really 'home' for us. I like to call it a 'gem in Uptown'. You cannot find an apartment in Uptown that is as beautiful and modern like Somerset. Neighbors are friendly, the management staff are great and the door staff are great too. Every time you have a problem, maintenance staff would do it right away. If you are looking for a place in Uptown, Somerset should be on the top of your list. Love this place. Staff is very friendly. Great Neighbors. The property owners did so well by this historic building... the renovation is superb and the interiors are gorgeous. I can't say enough good things about the staff. Attentive and very friendly, I would recommend this building to anyone. This is place is very nice. The apartments are all newer rehab with great appliances and individually controlled AC. The location is near public transportation so it is easy to get downtown, or pretty much anywhere in the city. No complaints. It is secure and clean. I lived at Somerset Place during the spring and summer of 2015 and was very pleased with my experience there. Management was extremely helpful, courteous, and quickly resolved any issues I had. The look of the apartment was beautiful, especially the bathroom and kitchen. There would always be something fun going on in the lobby or the rooftop. Furthermore, as a young woman frequently home alone, I always felt safe in the building. I've been living at Somerset Place for a little over a year now, just recently renewed. I absolutely love my apartment!!! Its chic, modern and beautiful, as well as the building. The Somerset staff is wonderful; I can't say enough good things about them. Plus this location is great! Sure Uptown hasn't always been great, but you can see the changes that are happening around the neighborhood and I certainly enjoy being a part of the community. It was a great experience overall...staff was always quick to respond to requests and very nice. Building is great and very well done. I love the staff here. They are super nice and really do get to know You! Wonderful building to live in! I've been here for two full years now, and I've had a good time of it. Staff is friendly and reliable, neighborhood is a little rocky due to proximity to the red line, but hey, proximity to the red line is a selling point too. Amenities are amazing, laundry rooms are plentiful, onsite gym, gorgeous lobby with a piano for those inclined. I can't speak for all the different room layouts, but the quality of the fixtures is high. It's not the cheapest you'll find in the area, but a great balance. The reviews tell all. I know a good thing when I see it.!! Going on my fourth year of good living at Somerset. Somerset Place has been an affordable and comfortable place to live. The apartments are one of the best deals in the city and the building has been beautifully restored. I love having access to the sky deck and party room as on-site amenities and convenient access to the lake and public transportation. While there are a number of community living rules, they are reasonable and easy to abide by in order to keep the facilities clean and safe. I was referred through a relative & I love it here! The location is awesome! Two blocks from the red line & two blocks from the lake & it’s wonderful! Erin & Matt take very good care in managing the apartments & are quick to resolve or answer any questions or concerns. The property is extremely clean & well maintained. They are always available either in person or by email. I looked at over 50 apartments in the city & this one by far was the best for the money, location and overall newness. Somerset is a great place in the Uptown neighborhood. You can't beat the location. All of the workers have been tremendously nice. Matt was extremely helpful during the entire leasing process. Jimmy the security guard/doorman is SO nice. He always has a smile on his face. He knows everyone & our dog absolutely loves him. The maintenance staff really keeps the place clean. We have only lived here for a couple of weeks now, but haven't had a problem yet. Neighbors are respectful, nice & friendly. I've been here since October & couldn't be happier. I checked out at least a dozen other places in the area in this price range & every other place had thirty layers of paint & hadn't been updated this century. It's hard to find a nice place that is dog friendly & Somerset had exceeded all of my expectations. The property manager Erin is very professional & clearly cares about how well she does her job. I regularly see staff cleaning common areas & the door staff are always friendly & helpful. The moment I walked into this building I knew I wanted to call it home, from the hallways that smelled like cookies to the management & doorman with warm friendly smiles, to the impeccable, spacious apartment with big beautiful windows covering its walls & all the amenities one could wish for, this was Home. With the help of Erin, it has become home. My boyfriend & I couldn’t be happier living here, our only complaint is that it’s so hard for us to get out & leave our beautiful apartment. I LOVE my apartment here at Somerset Place. It is unbelievably beautiful and the staff are the most wonderful people! Always helpful and I feel so safe with Jimmy as our doorman, he's the best! I cannot speak highly enough about this apartment complex, it's home and it feels that way 100%. I'll be here until I leave Chicago. I've had an excellent experience at Somerset Place. The location is great — close to the red line, Mariano's, and several buses. The shared spaces are beautiful, especially the lobby. And the minor repair issues I've had have been resolved within a few days, usually 48 hours. Somerset Place has been a wonderful experience for me from day 1. The amazing staff that is always there to assist and the easy to talk to security that make the resident experience that much more comforting. The lobby is kept to superb conditions at all times and the close proximity to transportation and convenience stores is also great! I've been here for a couple years now and it has been a great place. The location is wonderful (near the el, 151, and the lake) and the staff are always on their game. There is limited parking, so it is best for those that do not have a car, but other than that it's a really good place to live! I have renewed my lease with Somerset Place Apartments 3 times so far & I will renew a 4th time next year. Somerset Place is a wonderful place to live at. The management is great, very friendly, always with a smile & a nice greeting & when you need some assistance with anything everyone is very attentive & resolves anything immediately. When you live a busy life like I do anything can be taken care of via email which I appreciate a lot. There is always the amazing doorman who greets me. I have lived here for several years and continue to enjoy what it has to offer the amenities and the friendly staff: custodial, maintenance, doormen, and management in the building, I can not speak to the regional or corporate management as I have not dealt with them personally. As seen in previous reviews, the change in the building manager was a welcome one. Since this change, concerns have been handled quickly, appropriately and professionally. Parking in the area can be difficult. I love calling this place home! Lived here for 2+ years. Leasing office people are great, always available. Good amenities and so close to the lake. I highly recommend it! Somerset Place is always welcoming to everyone. I have lived here three years and I love I can call it home. You will love living here! Very cozy place with amazing management and doorman. Entire building is fully remodeled, nice and clean. Have lived here for 2 years and the building is fantastic! The door staff and the office staff are very friendly and helpful with any needs I have. I have been a resident for a little under 6 months. Choosing an apartment is very hard & you have to weigh what's important to you among so many other factors. Personally, I have really enjoyed my stay at Somerset thus far. The biggest factor in that has been the staff. Both Erin & Matt have done a great job at really making it feel like home. They're very personable, prompt & professional. They know each resident by name & their personalities didn't change after signing the lease. Been here 1.5 years and have had very few issues. Reading the reviews, sounds like the old manager was not empathetic and only in it for getting the lease signed. Not the case anymore. Agents are very helpful. Very informative with excellent follow-up. It's a place you want to call home, with attentive and caring management. A terrific option if you're seeking in the area. I really enjoy living at Somerset Place Apartments. The building, gym and units are beautiful. The staff are also friendly and helpful. They immediately respond to maintenance requests and fix it quickly. I definitely want to resign my lease at this place! I would definitely recommend it! It's also in a really fun area. We are loving living here! I've lived at Somerset Place for over 3 years. The staff are all friendly and really take pride in their jobs. The building is clean and quiet, my neighbors are nice, the sky deck is great and my unit is perfect! The property also does monthly events for residents which are always fun and you get to meet many of your neighbors. I'm looking forward to my future residency at Somerset.